Hello crafty friends! I am hopping today with the girls at Altenew to share a new set of Artist Markers. The new colors are absolutely gorgeous and the perfect addition to the existing Altenew Markers. To create this card I added 2 strips of stripped washi along the bottom of a white card base. I stamped the sentiment just above and then did a little black copic spritzing on the card base. After I colored up the blooms, I added them to the card front with foam tape. I love these markers because I am not a professional colorer...is that a word?... the set gives you 3 of each color so you can blend away and you always know you have the right markers in each color family. I'm so glad you stopped in today. Thanks so much! Hope you have a great day! Beautiful CAS card. Love how the flowers pop. Great coloring! Such a simple elegant card, love the way you added the black stripes! Simply beautiful. Thanks for sharing your talents. Those bold stripes on the bottom of your card really give this a whole new look! It's so fresh and graphic and you've made it look great! Love it! Very pretty card today. I have not seen that stamp set used...so this was wonderful...I love this new set of markers....thank you for sharing your pretty card...hugs! Beautiful card with these lovely colors! Just stunning, Laurie! Love the double width of black/white stripes across the bottom! Very nicely done and a great set to choose to color with the new set. Love how you used the stripes to ground the floral image. :) Such a pretty card. Gorgeous blooms - I love the contrast of the flowers against the graphic stripes - fabulous contrast. Beautiful! The B&W stripes really give a dramatic effect to the pretty flowers. Awesome coloring on the flowers... love the orange centers!! Absolutely love the touch of the black and white. Classic! Thanks for sharing! I love that you created a mesh of both worlds of a trendy & classy card... just beautiful!! Love your color choices & the addition of the striped washi really shows off the pretty flowers! I love Engraved Flowers. These new colors look superb on them. TFS! Hey, Laurie! Love this strikingly clean and simple card. 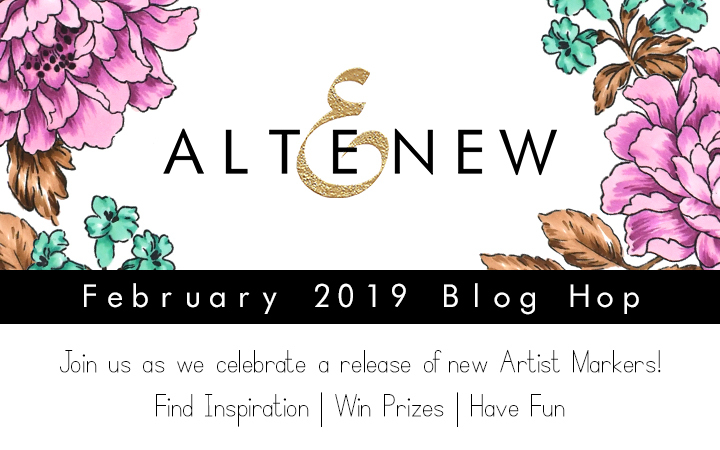 the new Altenew marker colors are gorgeous! 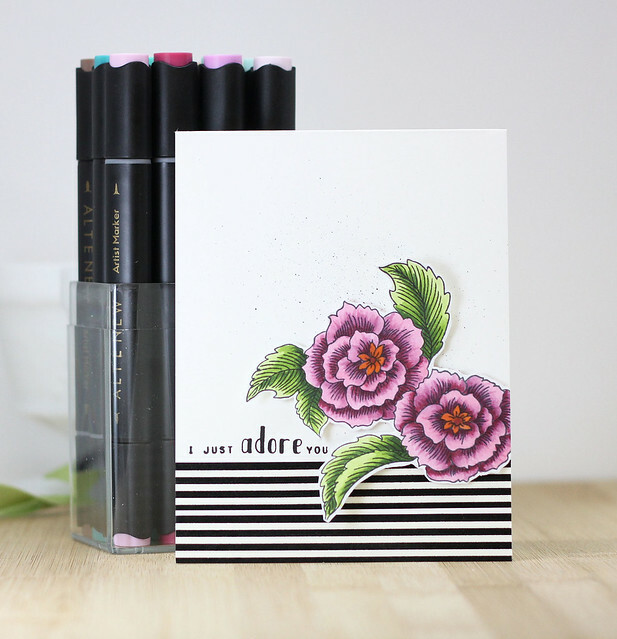 I always like black and white and your added flowers make your card a creative hit! Extra amazing and pretty card . Love your designs . Beautiful card, gorgeous colors and coloring. I love the clean look. Stunning coloring! I love that purple shade! Laurie, I say it time and time again: you rock the CAS world! Love this design, the Washi addition is so neat! Love the gorgeous colors of the new markers. Thanks for the inspiration! Beautiful card/colors! These markers sets are jewels just like the flower sets! Love your design with the striped background on the bottom and the pretty flowers. Love the contrast between the bright florals and the graphic black and white stripe. Beautiful card!!! Love the black and white stripes with the florals! I love your gorgeous card, Laurie! 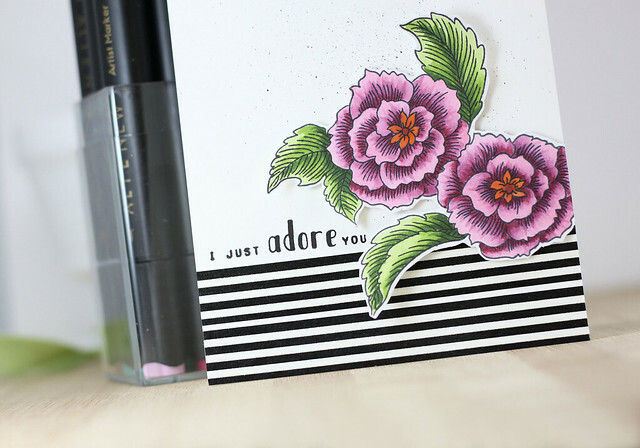 Those black and white stripes at the bottom really make those beautiful flowers pop off the card! Love the way your stripes ground the design! This is pretty Laurie! Beautiful coloring and I like the striped border. Beautiful card! I love addition of the black & white washi tape. Thanks. Love it! 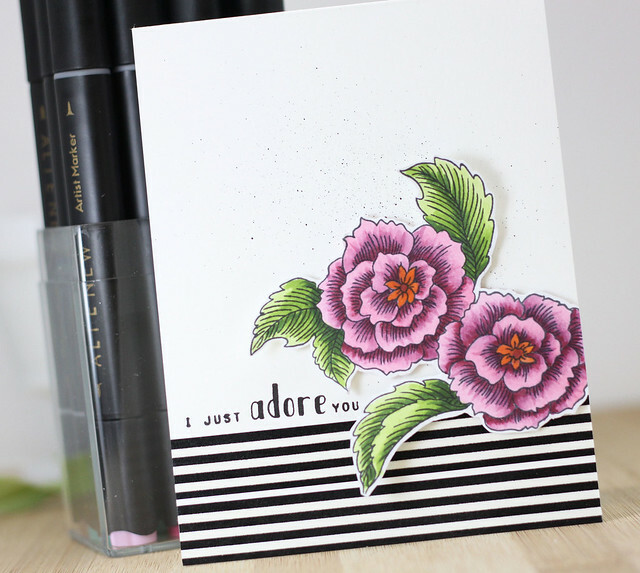 The black/white stripe background just gives the flowers that extra pop!!!! I love how it all works together to make such a beautiful card! Thanks for sharing! It’s a delight to leave a comment on a beautiful card creation such as yours. It is so so pretty. Very lovely card. Love the colors and the simple background that makes it pop. Gorgeous card. I love the use of the washi tape at the bottom of the card. It makes your stunning florals pop right off the page. I want to thank you for sharing your time and talent with us. WOW! What a fantastic card! Super gorgeous new colors! Your clean and simple style really appeals to me. Thanks for sharing! Fantastic card ! Great idea with the washi tape, nice. Colour ist should be a word of it isn't as I think those of us that can't quite claim artist without giggling can use colour ist ! A beautiful CAS card! Your flowers showcase the new colour markers wonderfully and the addition of the washi tape finishes it perfectly! Thanks so much for sharing your great inspiration! I just adore your card! Thanks for sharing! I love simple, elegant cards and this one has it all, thank you!!!! So beautiful! Love the washi tape at the bottom. And the flowers are really gorgeous. Oh My Gosh I love this card!! The b&w contrasts with the flower beautifully! I love that you used a touch of orange in the middle! It really sets off the purple so nicely!!! Beautiful coloring and I love how you added the Washi along the bottom...Gorgeous card, Laurie! Love that card! Simple, yet simply beautiful! Great sentiment, too. This newest marker set is just AWESOME! I agree, for us not-so-great colorists, they make it so simple! Wonderful card. Terrific balance between the graphic stripes and the stylized flowers and the GORGEOUS colors. Gorgeous card! Love how the flowers sit on the washi tape and your coloring is fabulous! Beautiful card! I love the combination of the stripes and the florals. I like that Altenew takes the guesswork out of choosing the right colors, plus they match their ink pads! Stunning card! I love the clean design and the bold stripes. It's nice to see the colors paired up with colors from other sets. Thanks for sharing this lovely card with us! Beautiful card Laurie! I love the bold black & white stripe at the bottom of your card - it really makes your flowers stand out! Your coloring is wonderful! This is a beautiful card. Such a beautiful card Laurie! I love the colors with the black stripes! Love the clean look of this card! The coloring of the flower is beautiful. So adorable! Love the black and white lines...they make the card pop! What a beautiful card! I love this stamp set and I love how you colored it. The black and white stripes at the bottom are just the right added touch. Lovely card! Great coloring and I love the black and white stripes! Love the striking stripes with the flowers! I really like the stark contrast of the black and white lines with the wonderful soft colors of the flowers!The dimension of the lines really makes the flowers pop right off the page and the splatters really are a great accent!